In all the attention that’s being given to the very real technical challenges being faced in the cleanup of the nuclear accident at Fukushima, it has been too easy to forget about the people who live there. But I know what it’s like to live in the shadow of an accident at a nuclear power plant. In 1980, when I was a young government official, I moved my wife and two young sons to Central Pennsylvania, near the Three Mile Island facility, when I was given a leading role in managing its cleanup. While the two situations are not identical, and the Fukushima event is more complex and will take longer to remediate, there are important psychological parallels for the people who live nearby: the anxiety, the unknowns, and the nagging feeling that they are being used as pawns in political and policy battles over the future of nuclear energy. My past visits to Japan, in the capacity of a technical adviser to the Fukushima plant’s owner, the Tokyo Electric Power Company, focused on the cleanup technical challenges. But when I went in May I went for a different reason: to connect with the people who have been affected, some of whom have been evacuated, and to bring them three things they need more of: accurate technical information, compassion, and a vision for a future of their communities. My wife Lynn and granddaughter Jessica accompanied me. 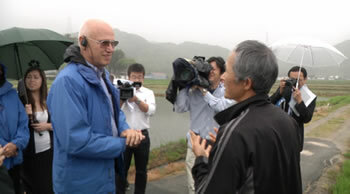 The people we met in the small, primarily agricultural towns near the Fukushima Daiichi plant impressed us with their sophisticated questions, and humbled us with their resilience and determination. Hearing their stories rekindled vivid memories of what we experienced 34 years ago at Three Mile Island. Lynn, who at the time was a childbirth nurse in the local hospital, shared the concerns of many mothers. And although Jessica wasn’t yet born in 1980, her father grew up and went to school near the shadow of the Three Mile Island cooling towers. Before sharing more about what we heard, a quick geography lesson: The Fukushima Daiichi plant is located on the coast, and nearby are mostly small agricultural communities such as Hirono, Tomioka, and others. The plume of radioactive contamination released at the time of the accident ran generally to the northwest, affecting individual communities differently. Some residents are in the process of being resettled after full or partial evacuations. Others, like the residents of Soma City, live just outside the evacuation zone. All the residents, whether evacuated or not, also had to contend with the effects the Great Japan Earthquake that generated the tsunami and destroyed or damaged thousands of their homes. One of our meetings was with a group of women from those towns. They were mothers, grandmothers, and expectant mothers. Like mothers anywhere, they are concerned for their children, and they are hungry for real information. Many feel that, despite TEPCO’s and the government’s efforts, they aren’t getting enough, at least not enough to counter anti-nuclear activists’ scare tactics. In fact, these people who bore the brunt of earthquake, tsunami, and nuclear accident are now being hurt a fourth time by those whose agenda is served by portraying the residents as perpetual victims. They asked me whether their children will be safe from radiation if they move back to their homes from the places to which they’d been evacuated. And they will. We know more about the carcinogenic effects of radiation than the effects of almost anything else, and it’s clear the exposure levels will be safe. They also need information to counter questions ? and stand up to guilt trips ? from people who say that things like, “How can you possibly go back?” Or, “Your children are radioactive and can’t play with my children.” My family endured these same types of comments when we lived near Three Mile Island. I also met with rice farmers and fishermen, who asked reasonable, well-informed questions. They wanted to know where the contaminated soil removed from their towns will be deposited. The rice farmer wanted to know if his rice fields will become more contaminated by water flowing down the mountains. It won’t, partly because whatever was deposited in the soil three years ago is already decaying substantially and will continue to do so. Fisherman worried that even though their fish is rigorously tested and proven safe; there is a stigma to the name Fukushima that will discourage purchasers. These same unfortunate questions burdened the good farmers near Three Mile Island, however they faded with time as the public recognized the quality and safety of the Central Pennsylvania food products. Others find themselves unable to fish at all, excluded from fishing in their traditional waters and equally excluded from encroaching onto fishing grounds long claimed by other fishing cooperatives. Surely a solution can be found that respects Japanese fishing traditions while doing something to ensure a future for these resilient people whose culture and economy are so closely linked to the sea. Diligent monitoring, along with significant improvements in the control of contaminated water at the plant will protect the sea and make clear that the fish from the area’s waters are safe. My family and I ate local seafood without any concerns about its safety. In the three years since the accident, when it comes to victims the focus has understandably been primarily on compensating them financially. But it is clear to me that proactive outreach from the government, TEPCO, and others are essential to address their need for information and emotional support. TEPCO has undertaken a long-term commitment to support the revitalization of the Fukushima area, and I urge them to include these kinds of outreach as part of that revitalization effort. 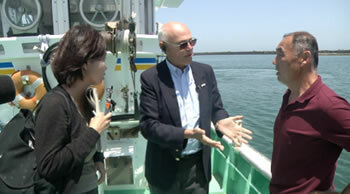 More than anything, the people of the communities affected by the Fukushima accident need hope. They need to believe that their rice fields will flourish again, their schools and workplaces will come back to life, and that their communities ? in which many have lived for generations ? have a future. 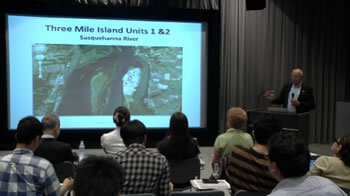 Pic.4 Mr.Barret’s speech at Aizu Univ. Hearing this from someone who had personally experienced Three Mile Island seemed to help. But it is not enough. A concerted outreach effort to the people of these communities, done in a way that respects Japanese culture and sensibilities, is essential if these determined but anxious people are to regain their confidence and their vision of a safe, prosperous, and happy future. 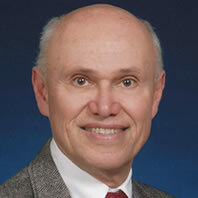 Lake H. Barrett is a retired nuclear engineer and lived near Three Mile Island when he was the Director of the Nuclear Regulatory Commission Site Office for the accident cleanup from 1980 to 1984.